Supreme Court Takes Up Birth Control Access Yet Again : Shots - Health News For the fourth time in five years, the justices consider a requirement of the Affordable Care Act that most health plans provide women access to birth control without copays. 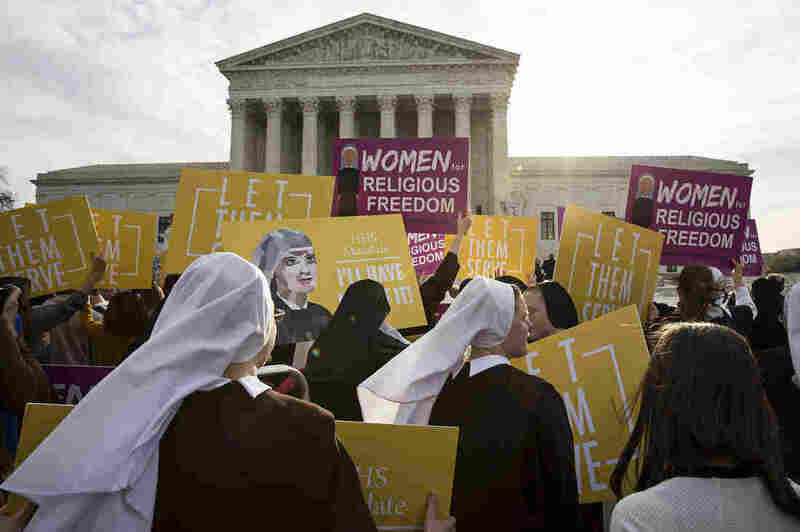 Nuns and others opposed to the Affordable Care Act's contraception mandate rally outside the U.S. Supreme Court Wednesday. On the sixth anniversary of the enactment of the Affordable Care Act, the federal health law was back before a seemingly divided Supreme Court Wednesday. At stake this time is the controversial requirement that most health insurance plans provide women with access to contraceptives at no additional out-of-pocket cost. Specifically at issue is whether a special accommodation the Obama administration has provided for religiously affiliated employers (such as universities or hospitals) still violates a federal law protecting the free exercise of religion. Under the rules issued by the Obama administration in 2014, religious nonprofit organizations don't have to provide contraceptive coverage, but they do have to either fill out a government form or write a letter stating that they object and telling the government who their insurer is so the government can arrange for contraceptive coverage to be provided. The current case, Zubik v. Burwell, is actually seven cases being considered together. The plaintiffs, led by the bishop of the Roman Catholic Diocese of Pittsburgh, argue that even the act of writing a letter makes them "complicit in sin" by enabling employees to obtain birth control coverage. "My clients would like to be conscientious objectors," attorney Paul Clement told the justices. "But the government is insisting they be conscientious collaborators." The liberal members of the court made it clear that they agreed with the lower-court rulings in the cases, all of which found that the requirements do not pose a "substantial burden" on the exercise of religion under the Religious Freedom Restoration Act. "It's not a substantial burden if someone else is going to do the action you object to," said Justice Sonia Sotomayor. Conservatives, however, seemed less convinced. "Their objection is the government is hijacking their insurance plans," said Chief Justice John Roberts. Even though the religious employers do not have to pay for or directly arrange for the coverage, he said, the employers' insurance plans are "being used by the government to provide these services." If the court deadlocks in a 4-4 tie, as seems possible, it could order the case to be argued again whenever there is a ninth justice to replace the late Antonin Scalia. Or it could issue a split decision that would uphold the appeals court rulings in question, but set no national precedent. This is not only the fourth time in five years the court has been asked to rule on a key aspect of the health law, it is the second time in three years it has taken up the so-called contraceptive mandate. In 2014, the court ruled 5-4 that the craft store chain Hobby Lobby and other closely held for-profit companies didn't have to provide contraception as part of their health insurance plans if they had a religious objection. The current case comes in the midst of an election campaign that could be affected by efforts to limit women's access to contraception and abortion. Not surprisingly, Democratic women were more likely than Republican women to say there is a widescale effort (56 percent vs. 25 percent) and far more likely to say that they are "personally concerned" about women's reproductive health choices (52 percent vs. 18 percent). The contraceptive case comes only weeks after the court heard a case from Texas that could limit women's access to abortion.